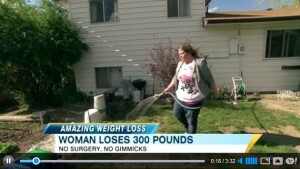 I saw this story about a woman who lost 300 pounds the “old fashioned way”. While there are many applauding her success, there are just as many that need to understand how much more there is to this story. First of all having weight loss surgery is not the easy way out or you wouldn’t have anyone regaining after surgery. Every single person that has had the surgery would have the perfect outcome and it would be the magic pill. What no one is saying are the statistics for someone who has lost this much weight on their own. Less than 5% of all people that lose this much weight have regained it all plus more within five years. When her body starts to rebel and she starts to have problems, I hope her support group will be there for her because long after the ABC cameras have left, this is when the reality of this process will set in. I have seen it personally several times. A few years ago I met a man that lost 200 pounds THREE TIMES! For the life of me I cannot imagine the strength it required to accomplish that feat. After meeting so many people through the weight loss surgery community, there are many of these stories. I personally have gained and lost hundreds of pounds, hundreds of times. She’ll get her fifteen minutes of fame and she’ll be feeling “all successful” and then the pounds start creeping back on because the weight loss was only a band-aid for the root problem and this poor woman will have to not only go back to a normal existence but an existence where she has a 95% chance of failing. My heart breaks for her and I desperately hope she’s part of that 5% that makes it. ABC does a major injustice to this lovely woman because they won’t care about her when she starts to struggle and of course they had to add “no surgery, no gimmicks”. That would imply that my 130 pound weight loss was a gimmick, or fake weight loss, or I cheated somehow. It really shouldn’t matter how I went from 260 pounds to 130 pounds and kept it off for ten years as long as I am healthy. I am healthier than I’ve ever been in my entire life. There are hundreds of thousands of post-ops just like me and you rarely hear our stories being told on Good Morning America or People Magazine‘s feature about women that have lost half their weight. That’s why we blog. That’s why we tell out stories on websites, You Tube or wherever we can. Some day the mainstream media will figure it out. It’s good that I’m patient because I guess I don’t have a choice…. I saw this and jumped on it right away myself. Wasn’t it like a slap in the face. When I heard the reporter say “the old fashioned way”, I cringed. I love this post. I’ll be sharing it for sure. I agree. I have been educating people at my new job. One asked me why don’t I just eat a granola bar instead of cooking. Funny huh?! I told her that would be easy. To please remember that I didn’t take the easy way out. I will struggle with this the rest of my life. They thought it was funny that I bring a bento box for my lunch. That is why I told them I has WLS. Positive so far. I am almost 3 months post op. Wonderful time in my life. I would love to go on the Joy fit part of the show, where people who have lost 100 pounds or more share their story. I may still try when I reach that milestone, we’ll see if they let me on. Yup. My family was quick to point this out to me. And I pointed out that It’s been a few years now since my surgery, and I’ve only put back on 5 lbs. (and yes, I’m in anguish over that some days). Let’s see which of us keeps off MORE of the weight. I get sick of “the old fashioned way” as being a positive thing. Leeches are “the old fashioned way”. We don’t promote that to increase our health. I thought the exact same thing. I watched the video clip this morning, thinking, WLS was NOT easy. its not magic, its not a gimmick. I am working hard to be sucsesssful and happy. its not like we wake up from our surgeries at our ideal weight, without having issues with food, excersising…ect. Kudos for her! I say keep it up, more power to you for being able to lose 200lns in 3 years. any way you do its not easy, if it were, none of us would have ever been where we were. I too “cringed” at the no surgery no gimmicks statement. Really. I am thrilled that she has lost her weight! She should be proud of herself for having lost the weight. Now comes the hard part, keeping it off. I hope she is part of the 5% statistic and keeps the weight off. When I hear the comment that she did it the hard way, I know in my heart we all did it the hard way. Surgery is a lifetime committment. So is fighting the demons that got us there in the first place. I hope she is working on that in order to keep herself healthy. I probably have lost over 100lbs 3 times before having the surgery. I laugh when people point this out to me. It has only been 10 months since my surgery, and I usually say. I’m glad for so and so who lost it without surgery BUT I needed it help. It’s also nice to see some of my friends and specially my brother point out to me, that I did the right thing for me. I needed help and I got help. Your blog is wonderful (as I’m soooooooo afraid my 130 lbs will come back!) it keeps me focus. Thank you!! The most didsrespectful comment I hear regarding WLS patients vs, dieters is that dieters “did it themselves”. This, from people who have no idea what it takes to mantain health, much less weight loss, when you have a restrictive/malabsorptive procedure. It becomes about eating and supplementing to live, not just lose or maintain weight. It also takes a lot of learning about nutrition, biology, chenistry and anatomy as it relates to the digetive system and metabolism. You ought to get sme kind of diploma for that part alone! Yep all the comments about “taking the easy way out” “not doing it the old fashioned way”. I did it the old fashioned way 100 times. I couldn’t keep it off until I had this miraculous surgery that allowed me to use a tool to control the damage I did to my metabolism for 30 years. That’s OK though…they can say what they want but until they walk in my shoes they will never understand. And you are right about that diploma! Isn’t that the truth Tiffany? I’ve known several women that have been fighting for ten years just to get the surgery much less anything else!